"What is prohibited under the law cannot be permitted", pronounced the Delhi High Court. The Bench of Justices Badar Durrez Ahmed and Siddharth Mridul upheld the ban on e-rickshaws, and said the Court cannot issue a writ of mandamus to legalise what is illegal as per the existing law. The Court held that the plying of e-rickshaws is illegal as per current laws and that the ban will continue till appropriate rules are framed by the Central Govt. The Court also said that it cannot anticipate legislative changes and that it was up to Central Govt. to frame the Rules. The Bench said, "we cannot anticipate legislative changes". It also held that review petition by Battery Rickshaw Welfare Association against the court's July 31 ban has now become infructuous. The petition in this issue was filed by social activist Shanawaz Khan through advocate Sugrive Dubey, seeking a ban on e-rickshaws. 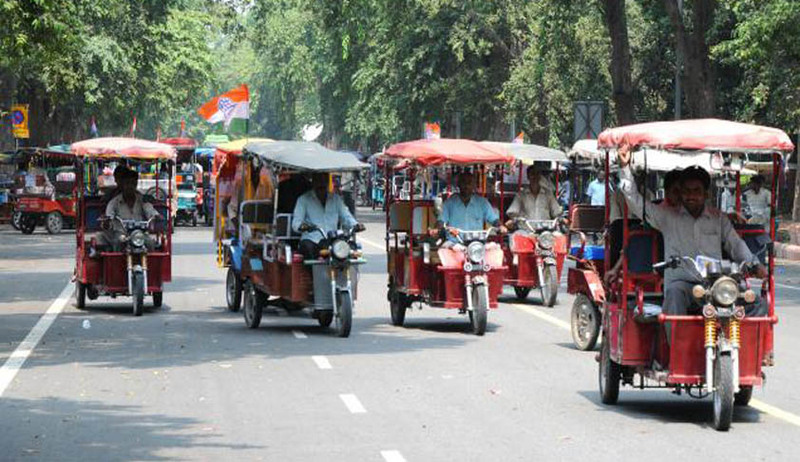 The petition stated "no person without valid licence be allowed to ply e-rickshaws". The petitioner had submitted that e-rickshaws had no registration numbers and the vehicles were putting passengers at risk.Claiming that the e-rickshaws are high risk vehicles, they have been involved in more than 200 accidents in the past 3 months alone, with two fatalities, the petitioner sought a ban. After the counsels for all the parties to the case, i.e. Centre, Battery Rickshaw Welfare Association and petitioner Shanawaz Khan had completed arguments, the Court had fixed August 29 as date for orders. Additional Solicitor General Pinky Anand, appearing for the Ministry of Road Transport and Highways, on the last hearing had sought a direction to vacate the court's July 31 order while saying that Ministry of Road Transport and Highways have submitted the draft rules before the Law Ministry. The counsels for Centre, ASG Anand, along with advocates Balendu Shekhar and S N Parashar, had sought that e-rickshwas be allowed to ply till October 15, saying by that time they will be able to bring an amendment in the rules.Proposal of the directions, to allow plying of e-rickshaws on city roads were also placed by the Centre before the Court. However, the traffic police in an affidavit filed before the court, highlighted serious concerns over the accidents involving e-rickshaws and said that unfettered operation of the battery-operated vehicles causes traffic problems on the roads.It had also said that as the operation of e-rickshaws is not covered under the Motor Vehicles Act (MVA), and hence police are unable to prosecute the drivers.